Maui is located right in the middle of the inhabited part of the Hawaiian island chain, with five nearby islands in plain sight. Its location may be one of the reasons for its appeal. Maui, the middle child, is surrounded by ohana, family, and perhaps, for this reason more than any other residents say they feel protected and safe here. It is intangibles like this that make up "sense of place," and the feelings engendered by this island seem to arise from subtleties and nuances like this. It has been said that Maui is actually part of a larger geological formation called Maui Nui (Great Maui), which is comprised of the islands of Maui, Lanai, Molokai and Kahoolawe. 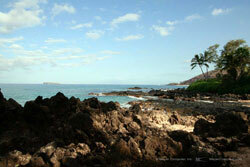 If sea levels were to drop only 300 feet, say geologists, these four islands would stand joined together as Maui Nui. Today this ancient geopolitical entity is still conjoined, collectively known as "Maui County". Maui, with its 727.3 square miles, is the second-largest island in the Hawaiian archipelago. After Oahu, Maui is also Hawaii's second most-visited island in the state, welcoming about 2-1/2 million people each year. Twice already it has been named "best island in the world" in the annual Conde Nast Traveler reader's poll. It confirms what the residents have known since before the coming of Western civilization: Maui simply is "no ka oi," the best. Within Maui's relatively small bit of space are contained three cloud-wreathed peaks more than a mile high, thousands of tumbling waterfalls and sparkling pools, remote valleys and rainforests with plants and indigenous creatures not seen anywhere else in the world, intensely brilliant rainbows that stack up two and three high sometimes, stark raw lava fields looking like a moonscape, 120 miles of shoreline and more than 80 sandy beaches (including two that are more than a mile long), and coral reefs and waves that go on for days. There's a lot of nature and natural wonders packed into this little place. In the east, one of those mountains, 10,023-foot-high Haleakala, or "House of the Sun", is a shield volcano with a crater so big and so deep that it can swallow up the island of Manhattan whole. Haleakala is a mountain range all by itself, and even makes its own weather. The summit of the second shield volcano making up Maui is 5,788-foot-high Puu Kukui, which is also the second rainiest peak in Hawaii with about 400 inches of rainfall a year. This volcano is twice as old as Haleakala and has weathered into the deeply carved and eroded mountain range known as the West Maui Mountains. Between the two volcanoes is the valley-like isthmus formed by their lava flows. The last one was Haleakala's 1790 eruption. The flat, fertile isthmus which link the two volcanoes give the island its nickname, "The Valley Isle."